Date and Place of Birth: 6 March, 1968, Kerbala, Iraq. 3- B.Sc. in General Chemistry, Hons, University of Salahaddin, Erbil, Iraq, 1991. (1996-2003), Iraqi and Libyan universities. Polarography, Flame AAS, Graphite Furnace AAS, ICP-AES and ICPMS), for fourth year students, (2012-yet). 5- Chemical Safety & Security, for first year students (2012-yet). 2- Teaching English Language for master students (2012 – yet). Chemistry, Diseases, Nano Carbone, Fingerprint and Forensic. predominant in Chemistry department (1991). – Libya) 2000 – 2003. 2- Director of Integrity Division for Kerbala University, 2003-2007.
committee, university of Kerbala (2015 – yet). 10- Member of Iraqi Chemists Union, (1992-yet). 11- Member of the Iraqi Union University Instructors 2006 – Yet). England, UK, 30th March – 3rd April 2009. Baghdad, Iraq, 3 – 8 September 1994. Administrative Development, 1- 13 August 1992, Baghdad, Iraq. Leadership Development, 21- 24 July 2013, Kerbala, Iraq. 7- Teaching Methods, University of Kerbala, 22/4 -8/5 2005, Kerbala, Iraq. 8- Windows, University of Ahlul-Bayt, 15 – 25 May 2005, Kerbala, Iraq. 2- Dean of Higher Institute of Teacher, Al-Qumos, Lipya, 2001. 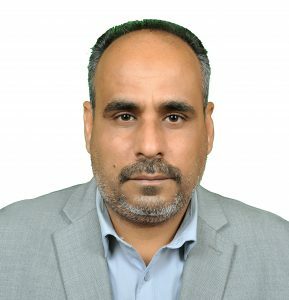 3- Dean of the College of Science, University of Kerbala, 2013, 2014, 2015, 2016. Journal of Modern Science, Vol., 2, 104-112, (2016). Engineering and Technology, Vol. 4, Issue 8, August 2015. University, Vol, 13, No 3, 176-182, (2015). Kerbala University, Vol, 1, First Scientific Conference, 271-282, (2013). cell, Journal of Education and Science, University of Mosul, Vol., 17, No. Vol, 5, No 1, 153-1157, (2007). Organization. Tripoli, Libya, 24-30 April 2003. T reagent, Journal of Kerbala University, Vol, 5, No 2, 164-171, (2007). Energy Organization, Tripoli, Libya, 24-30 April 2003. (in press), April, Journal of Kerbala University. USA, August16 – 20, 2015. 2- Analytical Research Forum, Loughborough, UK, 26 – 28 July 2010. 3- Surrey Festival, University of Surrey, July 2009. 4- Surrey Festival, University of Surrey, July 2010. 5- International Energy Conference, Tripoli, 29 – 30 April, 2003. 1- Eighth Iraqi Conference of Chemistry, University of Babylon, 1994. Kerbala, 13 – 14 March 2014. Kerbala, Kerbala, 26 – 27 2014.
of Kerbala, Kerbala, 25 – 26 2015. Kerbala, 24 – 25 2014. MOHESR, University of Baghdad, Iraq, 2013. 3- Chemical Security Training, New Mexico, USA, 20-22 October 2015. 20 – 30 December, 2014. 1- Minister of MOHESR (1). 2- President of Al-Qadisia University (1). 3- President of Kerbala University (12). 4- Dean of the College (17).